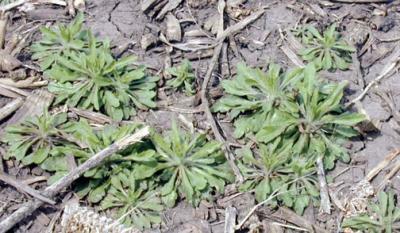 Winter annuals such as horseweed should be controlled at planting. Ignoring weeds present at planting provides the weeds a competitive advantage with the crop, creating a situation where weeds can impact crop yields very early in the season. Weeds that emerge after planting can begin to impact crop yields within two weeks of emergence; this time period may be shortened significantly if the weeds were established at the time of corn planting. The practice of delayed burndown applications in no-till fields where an early postemergence application is used to control weeds present at planting carries a high risk of yield penalties due to early-season competition. The objective of weed management is to protect crop yields rather than kill weeds. Today's post-emergence herbicides are able to control much larger weeds than was possible in the past, yet this creates the potential for hidden yield losses due to competition. Allowing weeds a head start on the crop greatly increases the likelihood of early-season yield losses. Thus, an even start for crops with weeds remains the foundation of sound weed management programs. 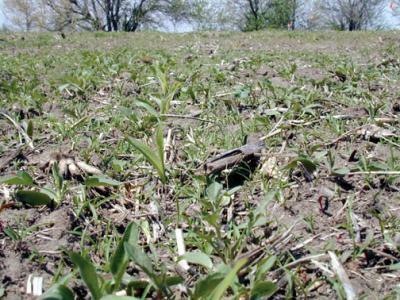 Weeds can begin to reduce yields shortly after crop emergence.